The defending champions advanced to a repeat of last year’s final on Monday (AEST) after a whirlwind start left Colombia chasing the game. Chile, who had destroyed Mexico 7-0 in the quarter-finals on Saturday, picked up where they left off, scoring twice in the opening 11 minutes to take a grip on the contest. Bayer Leverkusen midfielder Charles Aranguiz opened the scoring in the seventh minute before Jose Pedro Fuenzalida made it 2-0 after 11 minutes. But the explosive start to the contest was overshadowed by the intervention of Mother Nature at halftime, as a powerful electrical thunderstorm rolled into downtown Chicago and halted play. Tens of thousands of spectators were ordered to take shelter inside the stadium, leaving the ground empty as torrential rain pounded the stands. For a while it looked as if play would be abandoned, with the teams forced to return to the venue on Thursday to complete the remaining 45 minutes. Colombia had appeals for a penalty waved away early in the second half when Daniel Torres tumbled over the outstretched leg of Gonzalo Jara in the penalty area. With Real Madrid star James Rodriguez doing his best to take control of the match, Colombia looked lively in attack but were unable to find the final ball to unlock Chile’s defence. The Colombians’ job became even more daunting in the 57th minute when Aston Villa midfielder Carlos Sanchez was sent off, collecting a second yellow for a clumsy challenge on Aranguiz. Chile almost took an unassailable lead soon afterwards when only a superb diving save by Arsenal goalkeeper David Ospina thwarted Erick Pulgar’s close-range header. The closing stages of the game descended into a niggly encounter, with referee Chicas Aguilar of El Salvador eventually issuing eight yellow cards and one red. Sunday’s final will be the second time Argentina and Chile have met in the tournament. 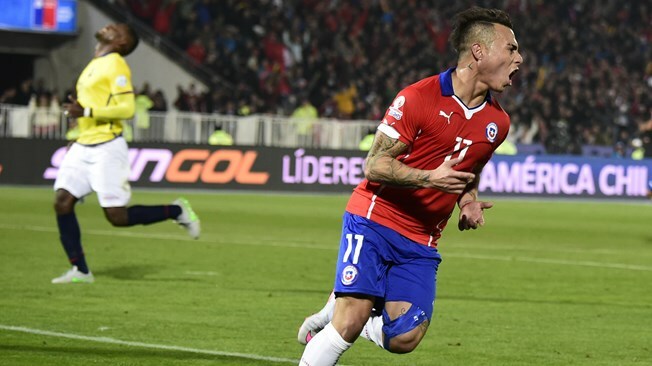 Argentina beat the Chileans 2-1 in their opening Group D earlier this month.